It’s been a busy summer in the Darrouzet-Nardi lab. We have been revving up a large number of projects. The biggest one is the fungal loop project looking at materials exchange between plants and biocrusts. 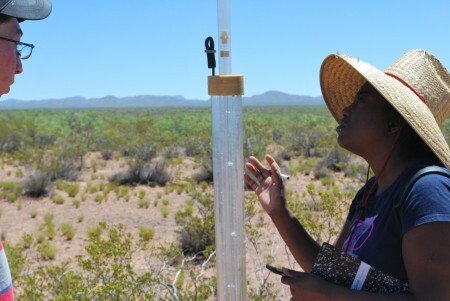 We’ve run some test runs for our isotopic tracer experiment at both the Jornada and the Sevilleta and we’ve also been working on some cool translocation clues from natural abundance 13C data, spearheaded by our awesome soon-to-be postdoc Eva Dettweiler-Robinson. An REU student, Isabel Siles Asaff, has been doing some great work on how plant and soil water potential may help to control translocation. Isabel and Jimmy working on plant-soil-biocrust water relations. 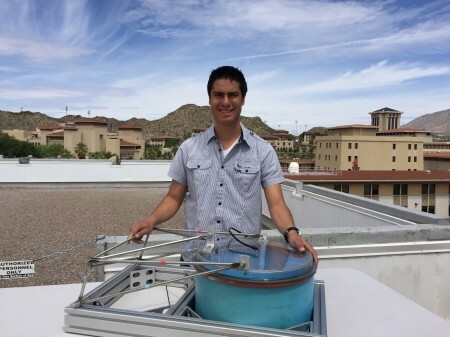 On another project, master’s student Alex Lara has been working on building automated CO2 flux chambers that we are going to deploy at The Jornada at a site with an eddy flux tower run by my UTEP colleague Craig Tweedie. 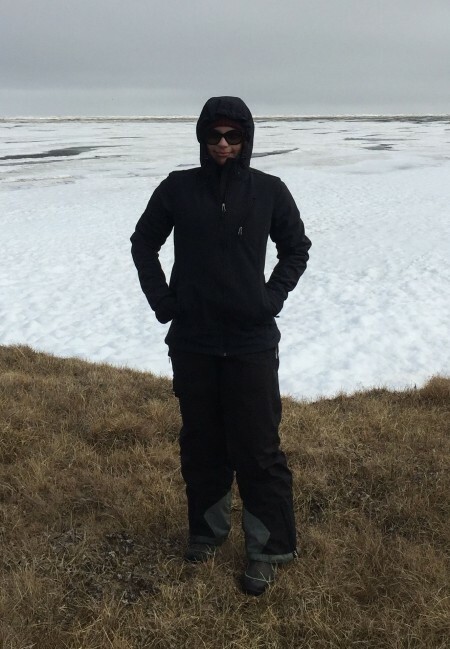 My first Ph.D. student Jane Martinez spent the summer up in the Arctic, mostly in Barrow, and also in association with one of Craig’s projects. She is bringing back boatloads of soil cores that we are going to use to take the plunge into some proteomics. Wish us luck! 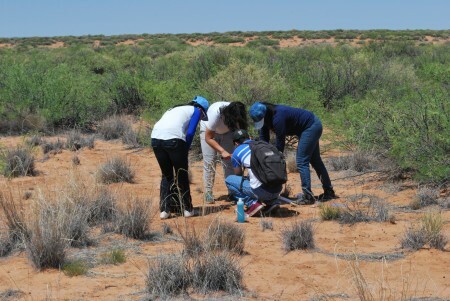 A brand new Ph.D. student starting this fall, Shani Rivera, has been working on setting up sites for an international project, BIODESERT, run by Fernando Maestre in Spain. 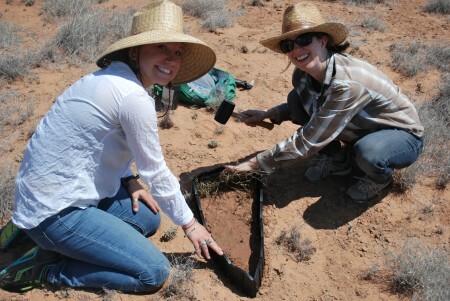 BIODESERT investigates the role of grazing on plant and soil properties in drylands around the world. I think they said they now have sites in something like 29 countries, which is amazing. We are really excited to be part of such a huge and neat collaborative project. Here’s a picture from one of Shani’s sites. 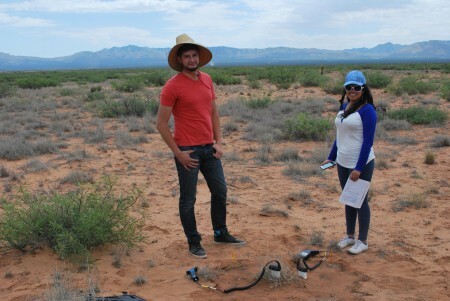 My UTEP colleague (and basically partner in crime at this point) Jennie McLaren and I co-advised two REU students, Shyla Cooks and Xavier Soto, who were looking at soil properties from a series of plots set up by Brandon Bestelmeyer, a collaborator from USDA/NMSU/The Jornada LTER. These plots were part of the Restore New Mexico project that seeks to restore grasslands in New Mexico by reducing shrub cover with herbicides. We are looking at what factors might help predict the success of the herbicide treatments. 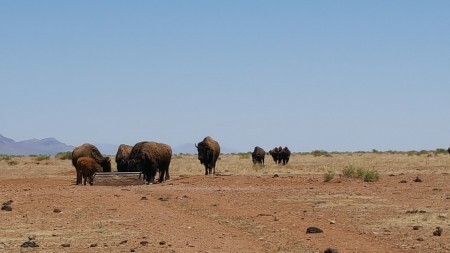 They had an eventful field season, with weeks of 100+ temperatures, run-ins with livestock, and a getting a vehicle stuck in a wash. Finally, I had two more excellent undergrads working in my lab this summer, Jaime Morales and Daniela Aguirre, who helped with all of the above projects in addition to a few others. Jimmy has become pretty handy with a Licor 6400 and has helped to measure photosynthesis on some greenhouse experiments here on campus in collaboration with some students from the chemistry department. Dani has developed some excellent bench chemistry skills and has been running a ton of microplates, including some I think pretty novel data on soil pore water from microlysimeters in semiarid soils. It’s been a great summer. I’m so grateful for all of the great work that has gone in to getting the lab off the ground.